Home /News/New Sports Offices Handed Over to Students Affairs!!! The Midlands State University`s Department of Works and Estates has handed over the new sports offices to the Department of Students Affairs at its Main Campus in Gweru following the completion of the construction of the facility. 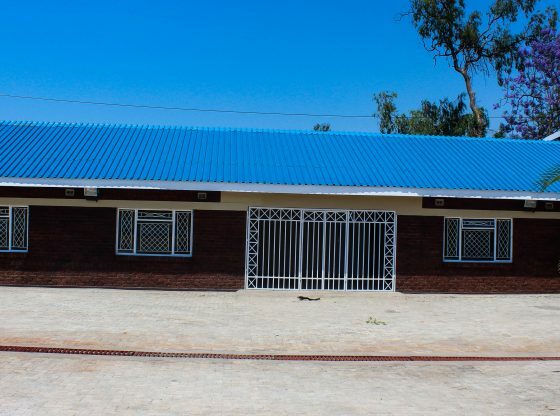 The new facility which cost $200 000 has four offices, two boardrooms, a refurbished ablution block for both male and female which also accommodate people with disabilities and an extension to both the east and west entrances. Solar geysers have also been installed at the refurbished facility as a way of reaffirming the institution`s commitment in improving sports facilities for students. The offices will be used as the command centre for the Zimbabwe Revised National Youth Games which were deferred to 2019 due to the outbreak of typhoid in Gweru this year. Midlands State University Vice Chancellor Professor Victor Muzvidziwa accompanied by the Bursar Mr. Adam Zvandasara as well as Executive Dean Student Affairs Mr. Isheunesu Chaka toured the new and refurbished facilities led by officials from the Department of Sports and Recreation as well as the Department of Works and Estates. Speaking during the handover ceremony, Professor Muzvidziwa expressed satisfaction with the facility saying it will meet the needs and expectations of the officials during the Zimbabwe Revised National Youth Games to be held in 2019. ” It`s good you have completed the project and we are hoping the users will find it even more homely. This is really excellent, especially when you start something and complete it you save money and the plan is simple but I think it serves the purpose so that’s the good thing if you have the skills, you do it yourself, that`s the way to go,” said Professor Muzvidziwa. Executive Dean of Students Affairs Mr. Isheunesu Chaka commended the Department of Works and Estates for the workmanship displayed in the project. “It looks nice even our students really appreciate this I think our works department did us proud especially if they can produce structures of this quality. So we are really happy about that and were already eager to see the completion of the project so that we can start using the facility,” he said. The next phase of the project will include purchasing of furniture for the offices and boardrooms, ten desktop computers for the Resource Board room and erection of grand stands for the courts.